A ‘Recipe for a Happy Marriage’ is a 3-dimensional gift with a cupful of thought and a generous amount of good taste. 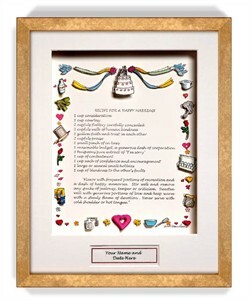 Framed ‘recipe’ makes an ideal gift for anniversaries, weddings, engagements and bridal showers. A special gift that will last a lifetime. 3 teaspoons pure extract of "I'm sorry"
"Flavor with frequent portions of recreation and a dash of happy memories. Stir well and remove any specks of jealousy, temper or criticism. Sweeten well with generous portions of love and keep warm with a steady flame of devotion. Never serve with cold shoulder or hot tongue." Availability: This item takes approximately 7 business days for processing plus transit time.